ReBUILDetroit’s overarching vision is to identify and improve, in a transformative manner, the recruitment and retention of underrepresented students into biomedical degree programs, introduction to biomedical career opportunities, and ultimately transition into personally rewarding graduate education and advanced careers in the biomedical sciences. ReBUILDetroit has an overall objective to have at least 75 percent of ReBUILDetroit Scholars graduate with baccalaureate degrees in biomedical science, or related fields, after completing four years of full-time study and have 50 percent of those graduates matriculate into biomedical research doctoral programs. To train a large number of students from diverse backgrounds within the program (BUILD scholars). 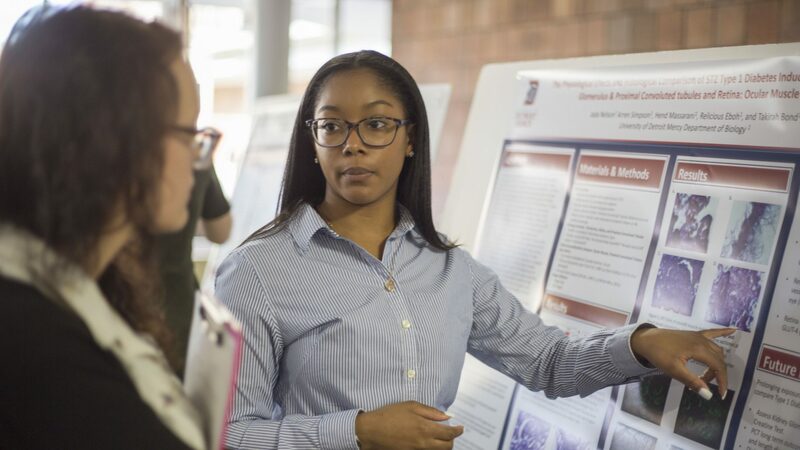 Since the curricular design will impact all undergraduate students enrolled in these biomedical science courses, the “halo” effect of the programs developed for the ReBUILDetroit project will impact a much larger number of students beyond just the ReBUILDetroit participants. To recruit ReBUILDetroit Scholars into Graduate Schools through an accelerated pipeline that will allow undergraduate students to obtain both an undergraduate and a master’s degree from Wayne State University (WSU) in the sciences in a total of five years due to an innovative sharing of credits in a 3+2 pathway for ReBUILDetroit Scholars. Similarly, credits from master’s programs will be counted towards doctoral degree requirements so that students can complete doctoral training in an accelerated timeline at WSU. Also, WSU will create dedicated ReBUILDetroit Scholars fellowships for those seeking a doctoral degree in the biomedical sciences. Articulation from 2-year community college programs to either an undergraduate partner or research partner institution for the completion of their bachelors’ degree is also a component of the project. The ultimate goal is for students to matriculate into graduate school and go on to be successful in biomedical research careers. To transform the culture of higher education institutions in urban Detroit to become leaders in training undergraduate students from diverse backgrounds so that these students develop into the next generation of outstanding biomedical researchers for the regional and national workforce to enrich the depth and diversity of perspectives in biomedical research. To create a consortium of urban Detroit institutions of higher education that will serve as a sustainable model for devising and implementing innovative approaches to enhance research-training opportunities for students who will diversify the biomedical research workforce. To leverage the biomedical workforce and the synergy between institutional partnerships created from this initiative to power the rebuilding of Detroit as it emerges from economic challenges, and to help Detroit establish itself as a center of international excellence in industry, education, biomedical research training and biomedical research careers.